Do you have visions of a relaxing and comfortable life on the waves, with the opportunity for long-distance sailing whatever the season and weather? 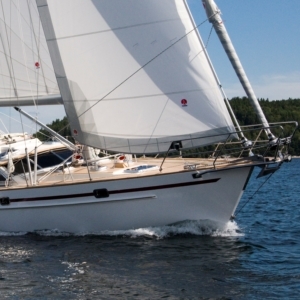 We wanted to realize our dream of deck saloon yachts with unsurpassed quality and sailing performance, in Orust. We wanted to create a new concept in the area of deck saloon sailing, a concept for the quality-conscious, for those who only want the best. We also wanted our boats to be built without the need for compromise, all in the same exclusive style. Round-the-world sailors, coastal cruisers, magnificent masterpieces down to the smallest detail. Just as we want to create boats that sail well and are of high quality we want to create boats for quality of life onboard. The journey should be as interesting and pleasurable as the final destination. Our beautiful archipelago is overwhelming and full of contrast, surrounded by barren cliffs and stormy seas. Life on the sea in Bohuslän is as beautiful as it is dangerous. This is what has characterized the art of boat building which has been handed down from generation to generation. The uncompromising construction behind a Regina starts early. We put more care into the choice of materials than anyone else. We personally select all the timber that will become your Regina-only the finest quality will do. The requirements are just as demanding for the materials and detailing as that we purchased from leading suppliers of fittings, sails, sheets and winches, electronics, interior textiles etc . Regina af Vindö represents a perfectly balanced combination of between traditional boat building and modern production ideals. Each craftsmen works according to an uncompromising philosophy and ensures that the perfect feeling of quality is achieved in every detail. Our long experience and the quality consciousness that permeates the whole company helps us create unique cruising boats. Boats with soul, boats built with the aim of being a joy for you to own for many years. 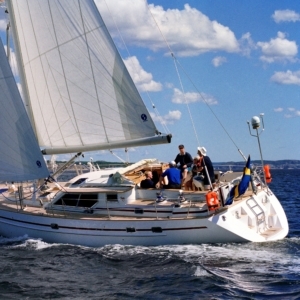 Regina af Vindö yachts quality shipyard is right at the heart of boat building industry Vindön on the northern Orust. We are a family business and have been building boats since 1972. Our company is synonymous with exclusive deck saloons that are excellent to sail. Our present values are the same as in the beginning, that everyone in the company should have the same feeling for the customer, strive for the best possible quality and that you, our customer, will get the boat of your dreams. 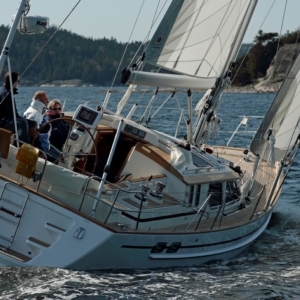 skipper of a REGINA 43.
of our deck saloon series.